BHALLA INTERNATIONAL is one of the oldest and largest Sports Equipment Manufacturing Industry in India, which is indulged in manufacturing of Sports Equipment in India since 1957. The company promotes & sells its product under the brand name Vinex. 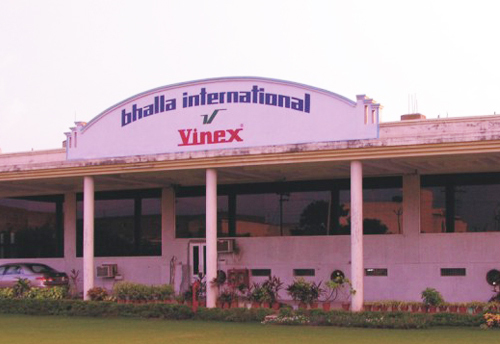 Since inception Bhalla International has focused on adapting the best manufacturing techniques available to produce the highest quality products with the lowest possible price. This can be evidenced from the No.1 Award given to company continuously since 2004-05 for the highest exports of Athletics equipment, for the promotion of Indian brand. We manufacture the largest range of sports equipment that accounts to more than 2650+ products only under one facility with the widest range of machining and tools facilities that facilitates us to produce not only traditional & non-traditional sports equipment but to innovate and produce non-sports equipment. We have 100 + IAAF and 1250+ CE EN 71 certifications on a varied range of our Athletics & Sports Equipment, which proves our ability to produce superior quality products. We offer the products with wide selection of products suiting different market segments right from Track & Field Equipment, Athletics Equipment, Agility Training or Speed Training Equipment (Agility Hurdle, Agility Ladders, Slalom Poles, Speed Reaction Hoops, Resistance Training Belts etc. ), Football Equipment, Soccer Accessories, Soccer Training Equipment, Basketball Equipment, Boxing Equipment, Playground Equipment, Rhythmic Gymnastics Equipment, Table Tennis Table Equipment and Accessories, Tents and Tunnels, Fitness Equipment, Beach Toys Accessories, Primary Sports Equipment, Physical Training Equipment and much more. We also customize and develop products as per customer requirement. At BHALLA INTERNATIONAL, we design our products with a strong emphasis on safety, innovation, quality and durability. All of our products are designed to provide you with years of top quality performance. We are highly dedicated to the supply of Sports Equipment and Services to our clients with the best prices by maintaining cost effectiveness through efficient business procedures. 62 Years of Manufacturing Excellence. We are manufacturing and Selling 2650+ products. We have 100 + IAAF Certified Athletics Equipment. We have 1250+ CE EN 71 Certified Products.